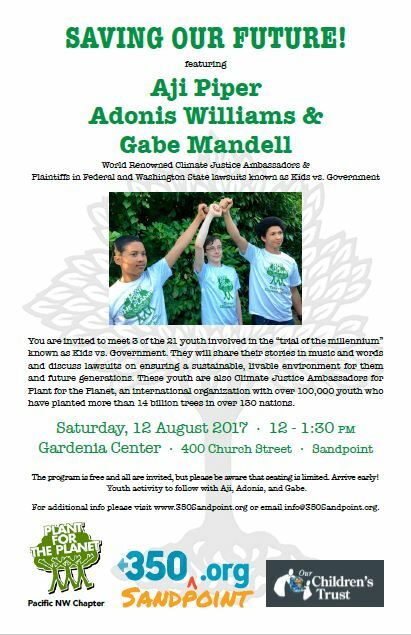 On Saturday, August 12, from 12 noon to 2 pm, meet Gabe Mandell, Aji Piper, and Adonis Williams, three of the 21 world-famous children involved in “trials of the millennium” – climate lawsuits brought by young people against state and federal governments [1-3]. These court cases allege that governments’ roles in creating and perpetuating the climate crisis violate the U.S. Constitution and public trust doctrine. Adonis, Aji, and Gabe will share their stories through words and music, depicting the renowned, federal, Juliana v. U.S. and Washington state lawsuits they have filed to ensure a sustainable, livable environment for them and future generations. These incredible litigants also serve as climate justice ambassadors for the Pacific Northwest chapter of Plant for the Planet, an international organization with over 100,000 young members who have planted more than 14 billion trees in over 130 nations . Through this public presentation and following youth event, with free but limited audience seating at the Gardenia Center, 400 Church Street in Sandpoint, Idaho, learn what you can do to join this movement. Event sponsors 350Sandpoint, Pacific Northwest Plant for the Planet, and Our Children’s Trust encourage family attendance. For further information, see the enclosed links and attached flyer and media release, and email and call the hosts at info@350sandpoint.org and 208-627-9084. Thanks! This entry was posted in Climate Change, Events by WIRT. Bookmark the permalink.